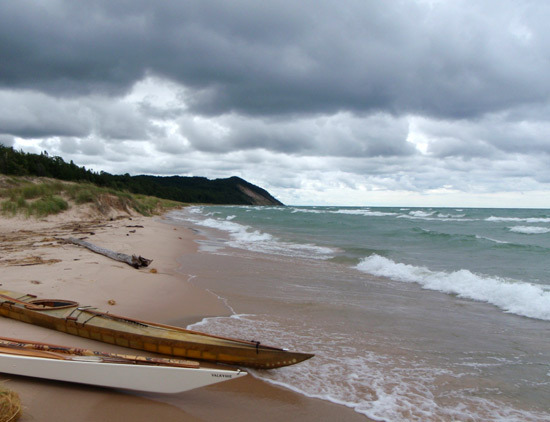 This years’ Michigan Training Camp (Qajaq TC) started off with a bang as storms created wild conditions on Lake Michigan, much to the delight of the participants. Dennis Asmussen, Mike McDonald and myself led a surf session, that provided a great opportunity for participants to play and test their skills and rolls in challenging seas. From the smiles and shouts that ensued, it’s clear that everyone enjoyed themselves. I was impressed that there were very few wet-exits, even though this was the first time that some students rolled in conditions. The short-period waves were great fun and you could occasionally coax them into giving you long rides of 100 yards or more. One breaker hit my foredeck with enough force that it sent my kayak reeling backwards and setup a nice back-surf, anchored by a hanging draw. Of course, the secret to surfing is that whenever something interesting happens (that looks cool), that you just tell people that you meant to do it!